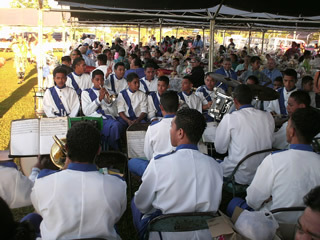 THE GOLDEN ANNIVERSARY OF MAILEFIHI SIU'ILIKUTAPU KOLISI was held during the last week of May 2007 up in Neiafu, Vava'u. The Tongans love to have this kind of celebration whenever a significant timespan has been achieved by an institution. 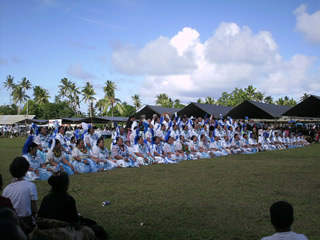 Other big celebrations are an annual event like the church conference, which is usually in Nuku'alofa but sometimes they will hold it in Vava'u. 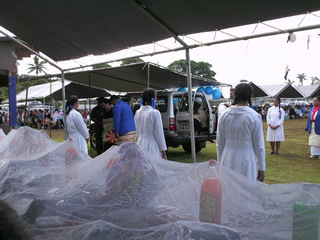 The Hospital week is another annual fund raising celebration that is held in both Vava'u and Nuku'alofa every year. So you can see that this type of celebration seems to be happening just about all the time, but some are bigger than others. This particular one was very big, however. I attended the event along with a few others from Ha'apai including Kalipoli, and we had a really nice time for two weeks there. There were singing competitions, dancing, bands playing, church services, many honorees and of course many feasts. Here is a group of several dignitaries at the front table, with my friend Lomikina down at the end there. I sat next to him and had one of three big lobsters that I ate that day. It is good to be friends with dignitaries! Lomikina was the head tutor at Taufa'ahau Pilolevu when I was teaching there in Ha'apai, and he was a graduate of Mailefihi Siu'ilikutapu, as well as working as head tutor there for many years. Like so many of the staff within the Free Wesleyan church schools, he is an ordained minister (faifekau). As a faifekau within a Methodist organization, he is moved from place to place as fits with the hierarchy of the church. He was at Mau'fanga last time I saw him. Also sitting with us was the founder of Mailefihi, and Kalipoli the head of the Wesleyan church in Ha'apai at the time. We are waiting for the arrival of a special guest. Here is Princess Pilolevu arriving at the feast. Her brother is the present king of Tonga. When I was teaching in the capitol at Tupou Tertiary, I used to attend the church there, which is her church as well. So I am accustomed to seeing her and I have the greatest respect for her. I think she would make a great queen for Tonga if that should happen someday. She is known to be particulary fond of Tongan dancing, and so there were many groups in attendance to dance for her party. She always sent out her attendant to give tips to the dancers. This tradition is called 'fakapale' and involves putting the money right on the dancer or in their clothing. The band was there at the feast each day to provide entertainment and to play for the dancers. There are many people who work very hard to prepare the feasts and put out all the food every day, and when the band begins to play some of them are moved to run out into the center and dance rather wildly. It's kind of funny how the Tongans are a rather reserved society, but at times like this a little crazy behavior is accepted. Actually, in Vava'u especially, there is more than a 'little' of this going on. At times I must admit it seemed undignified for these women to behave in this manner in public. Here is one group performing a kind of seated dance, which involved a coordinated movement of the hands, arms and heads. They sing and play drums sometimes along with the movements. 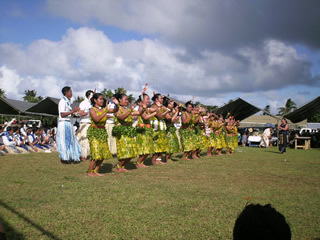 They continue to perform for a while and then the people come out and fakapale their favorite dancers. It is a very festive occasion and serves to raise a lot of money. I heard they raised $700,000 but that seems like a lot of money to me, especially for those of us working for the church and not earning very much money. But in Tonga, most everyone has family to help out. Here is another traditional dance being performed for the princess. In this one the dancers are covered in a fragrant oil which enables the money to be directly stuck to their bodies. They wear these decorations in their hair that make the head movements more pronounced. This kind of dance is usually performed by young women, but at one point a very old woman came out to perform this kind of dance, and everyone was laughing very hard as this seems to have been a joke to pull on the princess. She was a good sport and tipped her too. There was a big parade one day where all the different graduating classes from the very first one in 1956 up to the present graduates were honored. 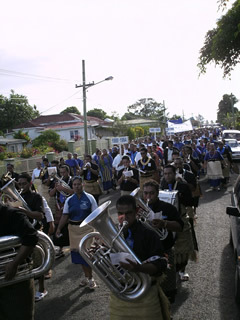 In addition to the college's own band, there was another band made up of graduates from Tupou College participating in the festivities. The parade marched through town from the feast area down through the downtown area along the harbor and was a big event for everyone. I saw a number of my old students in this parade, even though I have never taught at Mailefihi Siu'ilikutapu, there is some transferring of students between the different Wesleyan schools on different islands as people move from their home island to other islands for different reasons. Some move with parents and some move to live with other members of their families. 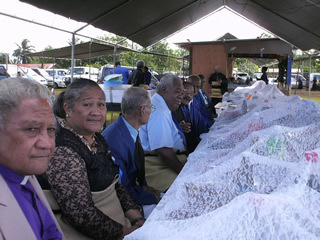 The Tongan families are often very large and at times it seems like everyone is related somehow. Here is one group of honorees I took a picture of. The man on the right end was the first principal of the college and is still quite spry even at this age. The two men on the left end were captains of the boarding house when they were students and I met them when we all stayed together in the dormitory during the jubilee. It was a great bunch of guys and they are all looking quite sharp in their Wesleyan blue suits. Everyone was very kind and we all had a great time. There was a lot of sharing of food, stories and prayer during our off times from eating big. Of course it would'nt be a Tongan festival without some fine Tongan singing. This group was found practicing outside the dormitory before the singing competition one night. 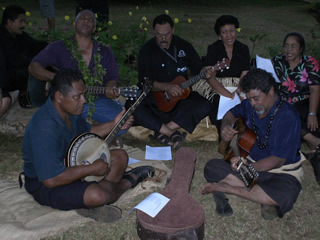 Although there was no kava circle at this impromptu rehearsal, that is the kind of setting where one most often would hear this kind of music being performed. I did attend a kava party in the church hall one night and was told they gathered a lot of money at these events too. Lots More Photos Click Here!